What a strange and beautiful summer we've had. The weather has been so unseasonably cool! Right now I have the windows open and I'm not even running the attic fan. Wow. This is NOT August. I'm used to 102 degree weather and the upstairs AC running non stop and still not getting down to what the thermostat is set on, lol! Saturday we went for a drive. Nova loves things with "pinchies", and Kevin had promised to show him some crawdads. So down to the "crick" we went! It was a lovely drive, everything so green... wildflowers blooming... a few trees beginning to change hue. A perfect lazy day. He wanted to take the crawdads home to show the cats. Melly was not too impressed. Hi Mr. Crawdad! I think we had about 5 in there~ they were set free later in a near by lake. I can't beleive it's been a year since my baby started "pretty" school. He started back to preschool on Monday. He sure has grown! I had to laugh as I put these two pics together for comparison. He's being a little goof in both shots, ha! I made a paint smock for him, it turned out pretty well. The fabric really annoyed me because no matter how you laid it out the print looked upside down. He likes it, that's all that matters! 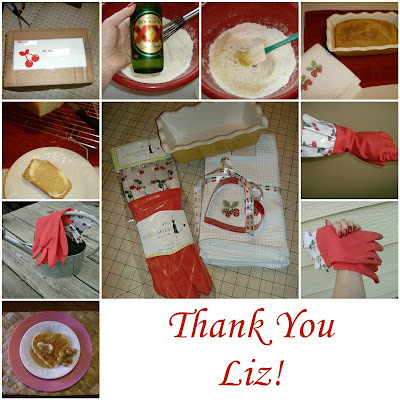 I couldn't find a smock pattern anywhere, and time was short! So I ended up buying this cheap $2.50 Simplicity 4927 pattern for a girls dress. Left the sides open, and cut out the flare a bit. I cut off the length of the dress and used it for pockets along the front. I thought I had some velcro at home, but couldn't find it. It was about 10 PM and I didn't feel like running over to Walmart, so I decided to sew some magnets to the insides. Seems to work and it's easy for him to get in and out of. Twyla and Lindsey at Two Crazy Crafters! To get the party started, let's have some wine~ shall we? 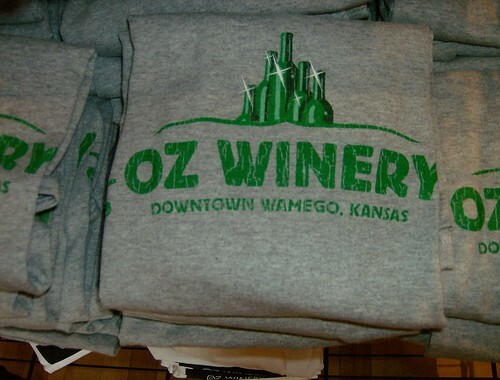 Back in April, we went to see a Wizard of Oz museum in Wamego, KS and next to it was a great little winery; Oz Winery. I just LOVE their logo, cool eh? The wine was wonderful! I've never experienced such a good wine tasting, there was *something* special in each one. Isn't the tin ceiling gorgeous!? This was about the third time I had worn the outfit for Halloween. The dress is very special to me because my Grandma helped me make it. Not to mention I was huge when I first wore it... and had to take it in twice, woohoo! Nova was only 18 months old! Doesn't he make a "dandy" lion? Both of them always have awesome hair videos. My hair was layered in that pic so I had no fluff to curl at the ends. Being a hairdresser, I can't help myself but watch the hairstyles in movies like a hawk. I can always tell when scenes were redone, ect. Look at how short and kind of thin Dorothy's braids/curls are in the black and white segment... and then notice how many times her extensions change during the scarecrow scene. Cracks me up! 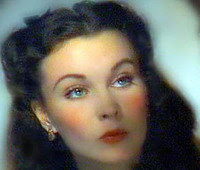 Her haircolor varies as well throughout the film; reds are notorious for that... Just like Rose in Titanic. 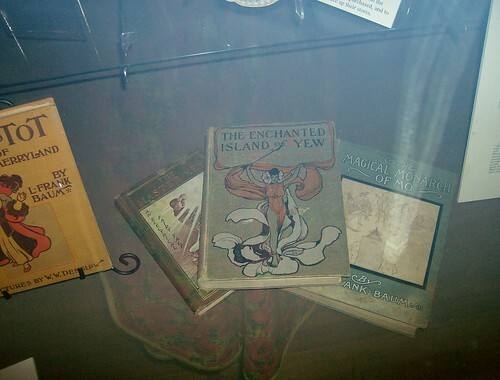 Before getting to Wamego, we stopped in Kansas City for a Wiz exhibit at Crown Center. 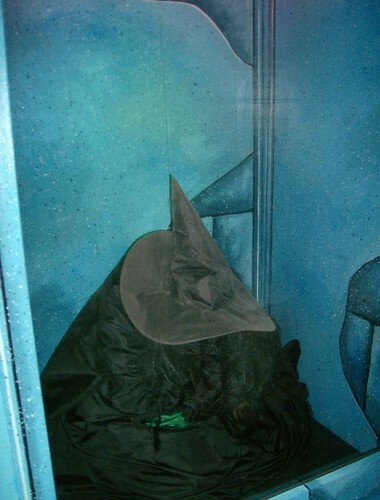 And melting the Wicked Witch! 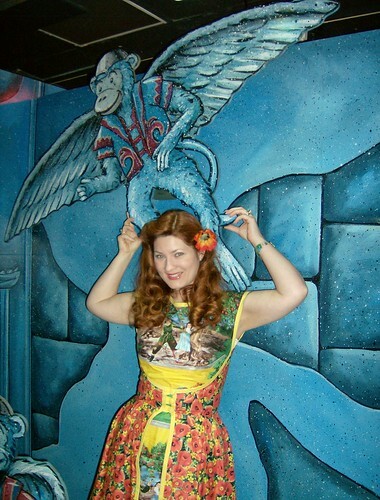 The pattern is Retro Butterick 4790. Going into the haunted forrest inside the Wamego museum... ooooohhhh I DO beleive in spooks!! I enjoyed seeing all the different books by Baum, such beautiful covers! Both the Crown Center and Wamego exhibits were fun, filled with tons of memoralbia. Lots of dolls, books, and info. I bought a book, "The Wizardry of Oz". A must for Wiz collectors! Next up.... you just won't beleive your eyes! An amazing hand made quilt by Sarah Lassiter. She quilted every scene in amazing detail! I love how she used the sepia fabrics for the black and white parts. 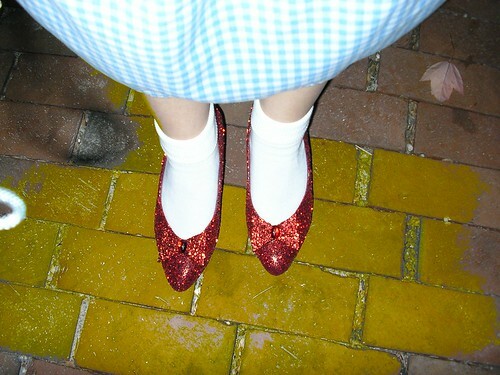 Dorothy and Glinda's dresses were 3-D! These photos do not do her talent justice. I stood there in awe for quite a while! I didn't touch it, honest! I just held my finger up to show the scale and unbelievable detail. Did you see the little hand stitched monkeys flying out of the witch's castle? Do you know who this is? I tried loading a copy of a cassette tape recording of me reciting the WIZ when I was 8 years old... er, almost 30 years ago. It is quite a hoot! But youtube rejected it for length, so back to the drawing board. I'll figure it out some time! Thanks for "dropping in"! You'll have to catch a balloon ride or click your heels to get home. 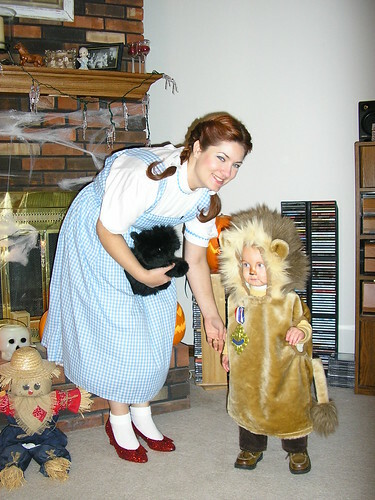 But before you go, be sure to visit the other participants in the Wizard of Oz Gala over at Twyla and Lindsey's! 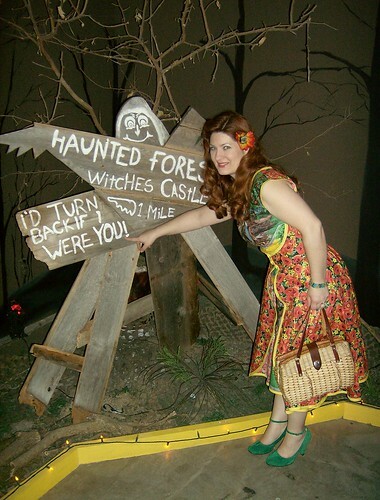 You may also see my past posts on OZ, which include the Wamego, KS OZ museum, how I made my poppies dress, and how to make your own Ruby Slippers! Click here. What's more, many photos can be seen and enlarged on all of the above in my flickr album. 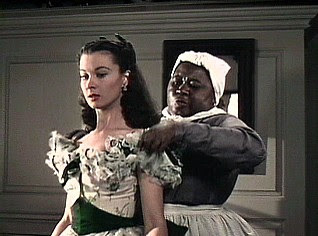 *And don't forget, the Gone With the Wind Ball is coming up! Click the button in my sidebar for details! Some recent junque in my trunk~ all for about $50! You know times are tough when you have to save money to go YARDSALING. Geesh. We had a town wide yardsale recently and I found quite a few goodies. I was SO excited because I hadn't been to a sale, fleamarket, or anything in a very, very long time. First up we have a gorgeous little chandy, are you ready for this? FIVE BUCKS. Yes. And to think I almost didn't even ask because I ASSUMED it was going to be more than the $35 I had with me!! I was able to straighten the crooked arm. I found all but 6 of the crystals next to it. LOVE this darling aqua vintage phone for only 75 cents! These are hard to find where the receiver hasn't yellowed. 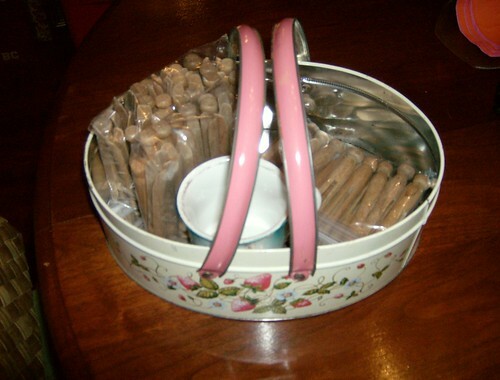 A darling little tin basket!! No lid but that's ok. The colors are so sweet! And this gorgeous mug~ sorry, not the best pic! Great vintage fabrics! There's enough of this cute butterfly material for a sundress. I've been wanting to learn ribbon embroidery and found these at two separate sales, woohoo! 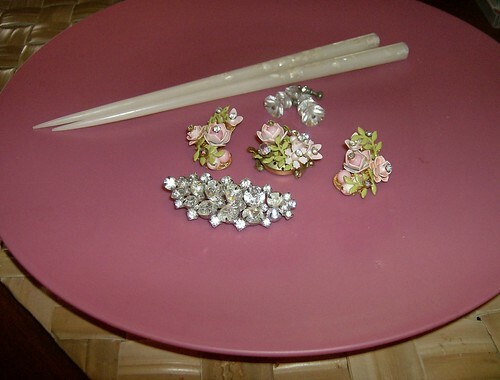 Awesome vintage jewels and hairsticks.... FREE with the $5 CHANDY!! And last, this beautiful old print. This was at a local consignment shop about a year ago. I really liked it but couldn't think of anywhere to put it. Plus, they wanted like $40 for it. A few months later they marked it down about ten bucks or so. I thought about it.... but still too much $ and I'm trying to watch what I spend more than ever now. Next time I went in it was GONE. Well, of COURSE I wanted it then!! I pouted about it for a while and got over it. It is in my dining room now, which is too green I think... will probably go in my parlor when it's finished. 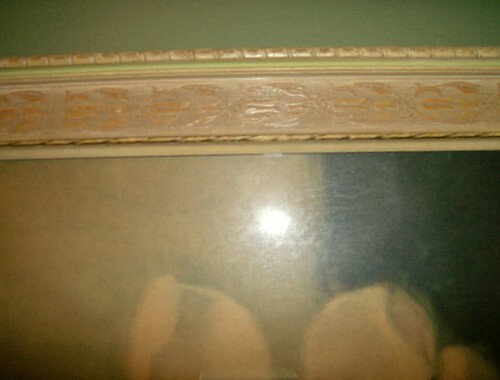 I love the frame too! 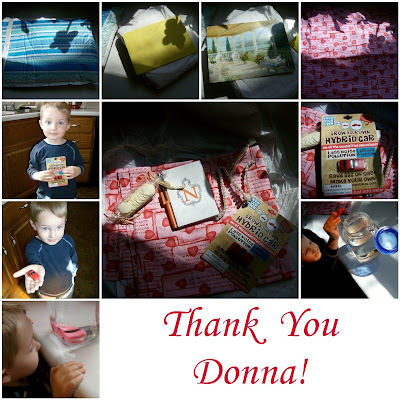 Thanks for junkin' with me! 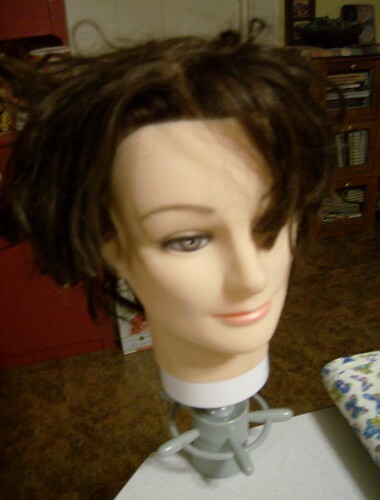 I've also been getting ready for my Gone With the Wind party, have you? Check a few posts back or in my sidebar for details! hosted by Natasha Burns at Artistic Creations! I found a red velour robe with good "bones" on ebay. I liked the idea of velour so that I could actually wear this as a housecoat for every day use. It wouldn't have the bell sleeves, but who can cook breakfast in those? I added a layer of tulle, then hand stitched on each row of lace. I cut the sleeves off at the elbow. Then ripped out the stitches and unrolled the amputated peices, which were then rectangles. Cut these into ovals, then cut out circles in the centers. Added tulle and lace to those as well to make new sleeves. Busted a vintage red beaded necklace to use for buttons. I was going to make a velvet belt, but lucked out and found a vintage one! Voila! While you're here I may as well show you a few more embellished costumes. This is Rose's Jump dress, made from a Morgan and Co. prom dress. I added beading at the underbust, rhinestone buttons, and sequined trim. I made an underskirt with tulle and added two rows of beaded fringe there. I then cut the overskirt at the knees to mimic Rose's gown. Rose's tea dress made from an A-line bridesmaid dress. I first cut off the sleeves. Then sewed down the sides of the dress to make it more slim on the legs. Bought some matching green fabric for a placket in front and back. Made an overskirt with a dotted lace, used curtain lace for the tiers. This is my next revamp costume to be. All from a $2 vintage suit. It will be a rather 40's does Titanic version, that I can wear more often than I would a full length suit. I have bought a purple tie, reproduction earrings, and found a gorgeous antique brooch. I have yet to find the right shade of velvet. ...And yes, there's more where that came from but I have to stop somewhere! If you'd like more info or want to see more photos, click on my flickr badges on the right. Thanks for visiting! Be sure to check out the other REVAMP IT bloggers on Natasha's link! Don't miss the Gone With the Wind Ball! Get details by clicking my sidebar button or going a few posts back. Hope to see you then! We have a winner folks! I want to thank all of those who played along and left comments for my give away! It was fun to see which old posts y'all dug up. What's been keeping me so busy? And here are the names I cut out for the drawing! And he chose..... Cat at The Vintage Housewife! Congrats you "sassy kitten", swing on by and give me your info so I can get your package out to you ASAP! Be sure to check out my upcoming Gone With the Wind Ball via the link in my sidbar, or the previous post. Would love to see you there! and will be anxious to visit your blogs as well! ...and put on plenty of rouge! This is my first blog party and I hope to see you then! You can click on the photos to enlarge. First up is a give away I won from My Big Mouth. EEK! This was back in February! It arrived in a festive mailer with a beautiful card. Inside was a yard of cute Valentine fabric with love quotes all over, a pearled initial "N", bath petals, a notebook, and a cool toy for Nova! He had a blast watching it "grow"! Still thinking of what to make with the material. I love the "N", I had see them on other blogs and was jealous~ now I have my very own! Next we have another give away prize from Rose Vignettes. This was in April.....geeeesh! I'm so ashamed for not sharing these earlier! 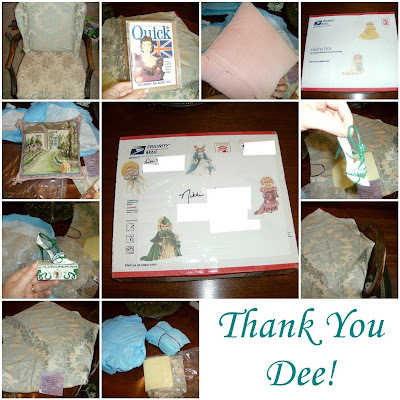 As you might be able to tell, this cute package arrived as I was busy making my Wizard of Oz dress. Ever since I opened it I was craving beer bread! I finally got to make it recently. Dos Equis was all we had on hand from a big mexican feast we had, lol! I made pretty pancakes with the heart cookie cutter. The "gloveables" are SO cute! I pulled weeds and my manicure was spared! The most recent gift is from my friend Dee. She has started a blog but has been very busy, so give her some time and check back! 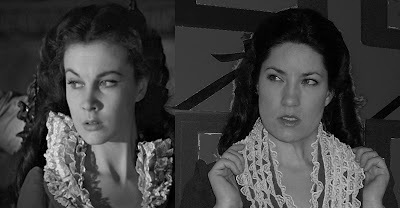 Some of you may know her from her VERY popular Gone With the Wind site, Scarlett Online. Just look at the package decorated in cute little Scarlett bears! Inside was some gorgeous fabric for La Boudoir. An adorable cottage pillow with a pink velvet back, a vintage Quick magazine with Scarlett on the front to add to my gwtw book collection, and a Scarlett/bbq shoe figurine. Boy do I wish I had some *real* shoes like that in my size!! The mag is from the 50's and is such a hoot to read. There were a few other gifts but I wasn't sure if they were meant to be shared.... but you know who you are and I thank you SO much!! It's my bloggiversary GIVE AWAY!! I'm not going to tell you what the winner will get, all I'm going to say is that it has something to do with THIS: Just remember I'm new at sewing and it shows in the "prize"! NOW~ in order to be entered in the drawing you must follow the rules! You have to visit an old post and leave a comment there. 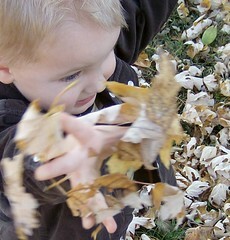 So, please check out my label cloud and blog archives in my sidebar and see what you can "dig up". Winner will be drawn on Tuesday, August 11th. Good luck, and thanks for following along with me! P.S. Many blogs are having trouble with their comment boxes lately. If you are unable to leave a comment, feel free to email me at n2gwtw@gmail.com. Just be sure to tell me about the post you viewed and leave your name and blog site so I know who to put in the drawing! I'm a wife to a wonderful man and mother of a sweet little boy. We have a 100+ year old home and four kitties. I love vintage things, esp. clothing and antique furniture. I'm very thrifty and spend as little as possible for my *junque*. Trash finds are always best! 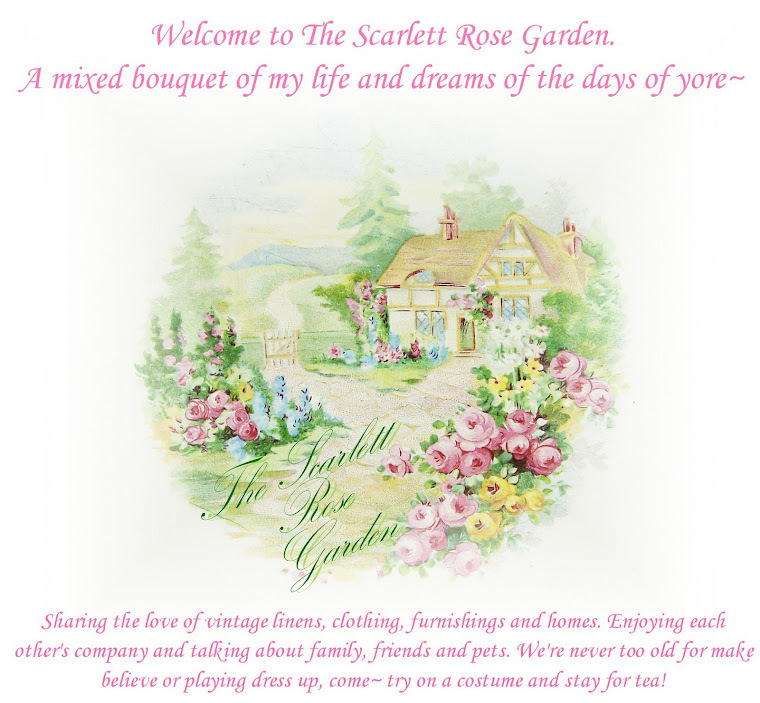 The wonderful people who make The Scarlett Rose Garden grow~ Thank you! Take a peek at some of my most frequent subjects! This is a Flickr badge showing public photos and videos from ohairas. Make your own badge here. 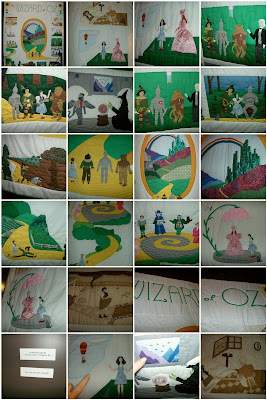 "Colleen's Quilting Journey to Oz"